The analysts of a recent business intelligence study by Transparency Market Research (TMR) has detected that the global chemical, biological, radiological, and nuclear (CBRN) security market is quite consolidated in nature with four companies reserving nearly 70% of the total shares in 2016. The four companies who are ahead of the curve, viz. Honeywell International, 3M Company, MSA Safety, and Ansell Ltd., have established themselves by expanding geographically, frequently indulging in mergers and acquisitions as well as eyeing strategic collaborations. For instance, the 3M Company acquired Scott Safety in Market 2017, adding the North Carolina based company to its portfolio. 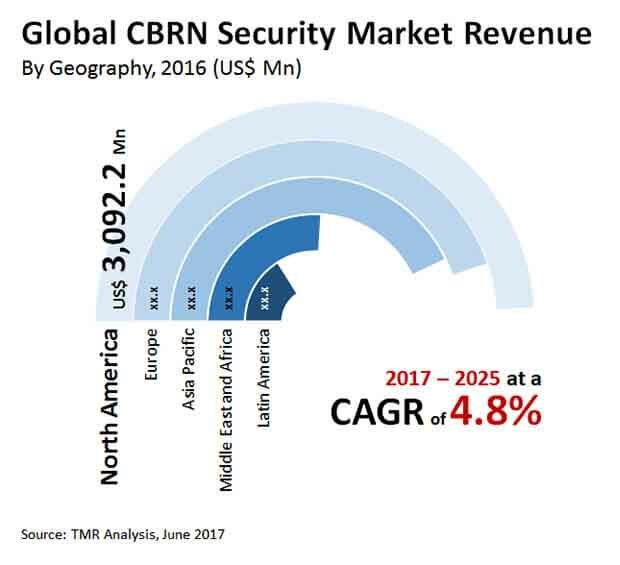 Boeing Company, Unisys Technologies, Lockheed Martin, International Business Machines Corporation (IBM), Accenture, and Siemens AG are some of the other notable companies currently holding a notable position in the global CBRN security market. According to the projections of the TMR report, the demand in the global CBRN security market will multiply at a CAGR of 4.8% during the forecast period of 2017 to 2025, by the end of which the opportunities in the market are estimated to translate into a revenue of US$15,074.8 mn, substantially up from its evaluated worth of US$9,890.0 mn in 2016. Going forward, the vendor landscape of the global CBRN market is expected to remain intensely competitive with the development of innovative products turn out as the primary mode for the companies to gain greater shares. For example, Honeywell’s NIOSH CAP 2 is quite popular as an escape hood as it offers nearly 30 minutes of protection from many contaminants and its dual cartridge design helps in providing comfort. The product is currently being used for industrial safety purposes. Based on type, the TMR report segments the CBRN security market into chemical, biological, radiological, and nuclear, with the latter providing for more than 33.8% of the total demand in 2016. On the back of strict government regulations and international laws pertaining to nuclear products, this particular segment is expected to maintain its leadership position throughout the forecast period. Based on function, the report bifurcates the market for CBRN security into detection equipment, protection equipment, simulation systems, and decontamination equipment, with the protection equipment currently providing for the maximum demand. Geographically, the analysts of the report highlights North America as the most lucrative region, gaining maximum demand from the technologically developed country of the U.S. That being said, Asia Pacific houses a number of emerging economies such as China, India, South Korea, and Japan, who all are incrementing their defense and security budget and are expected to turn the region into a highly lucrative one towards the end of the forecast period. Increased emphasis of a number of emerging economies, particularly those in the BRICS nation, is the primary driver of the global CBRN security market. These countries have recognized the threat that various foreign radicals such as cross border terrorism pose to their citizens and are allocating extended budget to upgrade their monitoring and surveillance systems. Unfavorable geopolitical tussles among a number of neighboring countries has led to cold war in various disputed locations across the world and growing concerns of CBRN attack is propelling the market for the systems that provide adequate protection against it. On the other hand, high cost of equipment pertaining to CBRN security and their maintenance are the primary obstruction that is holding the market from attaining its true potential in a number of emerging economies.